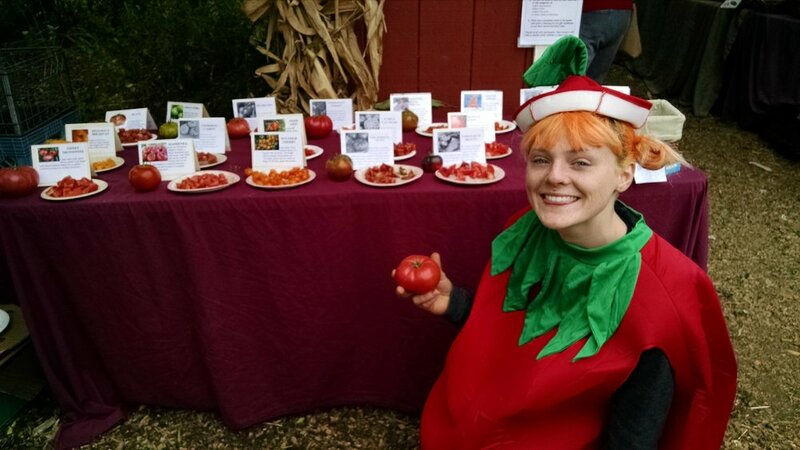 The annual Farm Fest on Saturday was a hoot— the only day of the year that I get to hang out on the farm, not feel like I need to be doing anything in particular, and really chat with people. 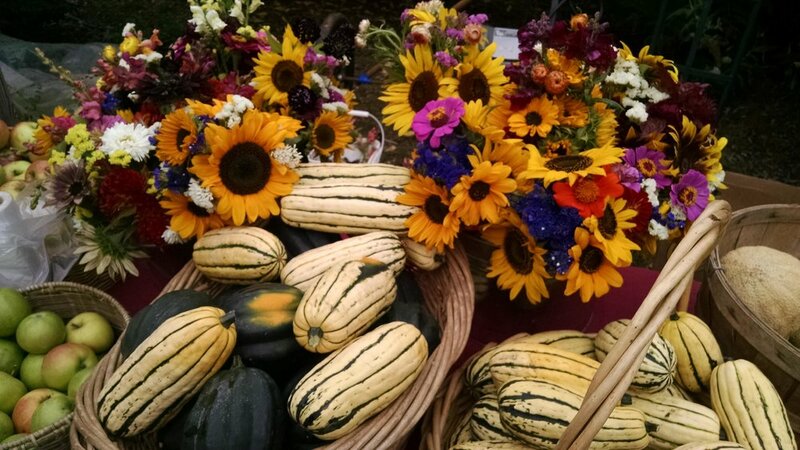 I spent the morning harvesting more flowers and making bouquets while the stand got set up, youth farmers set up infrastructure for the music, seating, cider pressing, and kids’ activities, and Jen coordinated the chopping and displaying of a couple dozen varieties of tomatoes for tasting. Attendance was a low, steady flow of regular farm stand and CSA customers, people with little kids running around, FOOD for Lane County staff and board members, and folks who just happened upon it for the first time— a now regular occurrence at the markets. The cider was shockingly (as it tends to be, despite trying it every year) flavorful and thick— a distillation of all that sunlight-turned-sugar with a strong dose of pome flavor. The tomatoes were shockingly bright, tart, sweet— numbing my tongue after a few tastes and then reinvigorating it every time I went back with a fresh pallet. Zing! The farm stand display barely fit on even an extended line of tables out front— the season is abundant and we’re in the exact moment of overlap between summer and fall crops, when eggplants and strawberries shine beside the dried onions and winter squash. To share it all makes me proud, and to see how much people appreciate it and are wowed by the farm makes me grateful that I’m such an integral part of it. The stand is up. This week, we miraculously finish with 10-15 minutes to spare, so everyone jumps in help weigh out zucchinis, carrots, beets, and cauliflower for restaurant orders. We keep regular accounts with 100 Mile Bakery in downtown Springfield, as well as Ciao Pizza on Gateway Road, and I pretty much always end up filling them last-minute once the market is ready. We choose the highest quality bunches, best looking zucchini, and throw in a few extra leaves of spinach rather than risk short-changing them. On the one hand, these types of orders would be the best candidates to get imperfect produce, since they'll chop it up and cook it before anyone else sees it, but I tend to reserve the highest quality for them since a) they order reliably every week, b) we're selecting it for them-- they don't have the opportunity to choose between bunches like our market customers, c) they could start ordering from other farms if our quality lags, and d) there's just a degree of professionalism and quality that exists in the industry, and I want us to stand out. I beep the horn a few times as I pull past Michael in the red truck. Two interns have already left to open the driveway at the hospital, and two youth farmers are following behind Michael to meet us there. A basket flies off the truck as I cruise down Game Farm Road, and I look back in the rearview mirror to see Michael pulling over and running out to grab it. Got my back. It's in, and we're off again. I hardly see the farm or get to work with the crew on Thursdays. I'm at the warehouse mid morning to pick up the market truck, leftover CSA totes, and a road sign to set out near the hospital. By eleven o'clock, I'm usually arriving at the farm, saying a quick hello to whoever might be washing produce up front, then diving into what I call "market zone". It's a fun zone, and it feels entirely separate from the workings of the farm despite being intimately reliant on them. 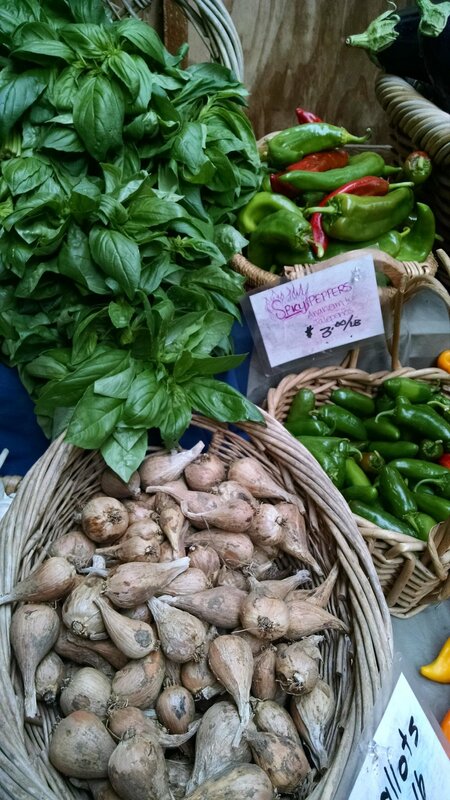 Today's feature: veggie glamour shots at opening day of the farm stand. Eat your heart out. Alice and Phillip. Last I saw them, they were lounging in camp chairs in the evening sunshine, listening to podcasts and chatting with passerby about the upcoming sale. When I arrive in the morning, they're standing near where they camped out to "guard" the sale, sipping coffee from their thermoses and cracking jokes with a few other early volunteers. They tell us about the neighborhood kids who played on the straw bales in the evening and declared that this sale should happen every day. They make sure we're set to go for the morning before bowing out to enjoy the day elsewhere. They've already done so much. I had to wait a couple days to write about the plant sale, and I'm glad I did. People keep asking me how it went, and I've narrowed down my telling to a few key details: the weather cooperated for the morning with sunshine and wind, an impressive amount of people came out considering the dismal weather forecast, there were the perfect amount of people helping out throughout the day, and we ended up breaking our sales record by the end of it all. We've gotten it to run as smoothly as possible, people gave us great feedback about the plants, and I was personally quite happy to be healthy and have a voice, unlike last year. That's the short story, and I'm not going to drag into the long story here. Instead, I'm imagining how all those baby plants are doing in their new homes. This weekend has been approaching, steadily in the background, all season. As I've pruned fruit trees, seeded veggies for the farm, transplanted 150-foot beds of onions and made batch after batch of potting soil, I've felt it getting closer. The anticipation felt light and abstract in early February, when we had a series of seeding parties with Grassroots volunteers. Lettuce and chard seeds were dropped carefully into six-pack trays, covered with soil, and arranged on our nursery benches to germinate. As the weeks passed, I got to watch them grow as I passed through the nursery with a sprayer hose every day. When the nursery filled up, we moved the cold-hardy seedlings next door to the overflow greenhouse, and kept seeding more and more. I spent days with interns and volunteers thinning and pricking out the trays to make sure every six pack was full, and every plant had the space it needed. Soon after that process, we started labelling each little pot with a white tag to identify its species and variety. The plants grew slowly at first in this cold spring. We managed the greenhouse doors carefully to keep them as warm as possible, and just a week or two ago, they finally popped. They're beautiful. They're ready for the annual Spring Plant Sale tomorrow. And the forecast calls for 20-30 mile per hour winds and an inch of rain. Oh, well. At least we got to enjoy the sunshine today while it lasted. Since I can`t upload photos at the moment, I`m going to skip about a week´s worth of stories and pictures from the coast and bring you right up to this morning. Stay tuned for another post that`ll make you drool over the coast of Ecuador. I am so, SO pleased to be back in the Andes after two weeks on the coast. The air is thin, fresh, and cool, sending whiffs of eucalyptus and pàramo grass between puffs of exhaust from the buses. I spent two days, about 13 hours in all, to arrive in Latacunga just south of Quito. The town is situated between Mount Cotopaxi and a semi-famous loop of indigenous villages, where many people go to visit the Laguna Quilotoa. Sleepy and weary, I skipped the loop and stopped in Latacunga for a couple hours to bask in the Andean sun and explore the town. The difference between the coast and mountains is remarkable: beyond simple factors of climate, flora, and fauna, the people here appear more reserved, conservative, and less curious and outgoing toward me. That said, I feel more comfortable here as a lone woman because the men don`t gawk (much) and people seem more occupied in general than on the coast, where from every window somebody stood watching, statuesque. I was planning to stay in Latacunga, but for some reason felt like moving on once I got there: an impulse that hits, I`ve found, when I feel alone and uprooted. I stopped in the town of San Miguel de Salcedo, just a few miles south of Latacunga, in order to try their famous ice cream. Just about every store in town sells these layered cones of flavors on sticks, and a couple people were tickled that I´d come just for that reason. Not surprising, though, since the ice cream was fabulous and made right in town. Mine was vanilla with some strawberry jam inside, followed by layers of taxo, passionfruit, and naranjilla. You know me. I`ll be thinking about that ice cream for weeks. This morning I hoisted myself out of bed in order to visit a market south of Riobamba, in a little town called Cajabamba. I had read that it`s Sunday market is huge and colorful, and since I really haven`t visited a market here yet, I was excited to get out and see what was on offer. The bus dropped me at the main stop, where a long row of vendors stood behind their stalls of potato balls and whole roasted pigs, clients sitting on stools all around. I passed them by for the time being and bought a couple of beautiful, intensely flavorful red bananas. An ancient woman sat with a young sheep on a leash as I walked down a side-street toward the market: she was just the first of several I saw, tugging their sheep behind their ponchos and skirts. The women here (and impressively, even many young women and girls) where different versions of a poncho, sweaters, shirt, close-toed shoes, and fedora-style hat, usually with a peacock feather sticking up from the side. Sometimes they`ll have a shiny embroidered hot pink poncho and high heels, I assume to be more fashionable, but either way the garb is standard and ubiquitous. I love it. Women`s hair is usually long, braided or in a tight pony tail or wrap, and their earrings and necklaces are gold, dangling gracefully around their smooth, steadfast faces. The market itself was fairly ordinary, as far as foreign markets go. Stands upon stands of bananas, taxo, zapotes (which I have yet to try), and avocados surrounded another section of vegetables: tomatoes, carrots, white carrots (a native Andean crop), cabbages bigger than basketballs, onions and leeks and peppers, oh my. Around the corner, twenty bread stalls. A section of huge bags of bulk pasta, rice, fresh-ground wheat, and corn. One of the buildings was full of hanging meat, and I tried to hold my breath as a scurried past the tables of pig heads and rows of cow liver hanging at my shoulders. The other was full of prepared food, and I stopped for a plate of that potato-ball-pork-rind combo. Not as delicious as last night´s pile of potato-pancake-fried-egg-pork-salsa on the street near my hostel, but still satisfying. I sat with a young woman near the stall and was surprised to learn that she was my age and had just one baby. Usually I feel like an old maid when I speak with anyone, since my marital status and age unfailingly come up within two minutes of the Buenos dìas. Fortunately today, the elderly vendors I spoke with in the plaza were delighted to hear my story-- once we began to talk, they opened up, warm and curious. I sat down on a long bench, and soon the woman next to me turned and asked where I came from. I learned that she lives in Riobamba and makes braided nylon ropes to sell every day there, but on Sundays she comes to sell in Cajabamba. She was seventy-four years old, probably about 4´10¨ (not very short around here), and her smile was contagious despite its showing only four bottom teeth. She referred to me as ¨mi hijita,¨ which translates to an endearing ¨my little daughter,¨ but is used between strangers all the time. As she gathered her ropes to continue selling, another elderly woman approached to buy, four for a dollar, and we shook hands goodbye. The man to my left, in a felt fedora and windbreaker, seemed to speak little Spanish at first, but we ended up talking for a while as well. He was selling at the market with his wife, smiling and wrapped in a plaid wool poncho, and a couple sons. They lived just up the hill and had ¨una docena¨ de hijos (twelve or so), where they farmed the usual papa, cebolla, zanahoria blanca, etc. I was happy to share my farming experience with him, and that I was interested to see this market because I worked at a similar one in the Estados Unidos. Really, besides the degree of ¨scraping by¨ that farmers and vendors experience here, the market itself is similar to one in the States: people get together, chat and catch up on the week, select and sell and eat, and hopefully go home with some cash. For me, it was an opportunity to try new produce, stock up for the week, and most importantly talk with some of the locals whose lives seem incredibly different from my own.